Honestly, it took me a while to love this. I was anticipating this book for months. And then I started reading it and… for the first 100 or so pages, I though it might just be my first DNF of the year. It was really hard for me to get into the story. The writing style was very unique, but rather dense and tough to focus on, at least it was for me at first. A school of assasins. I repeat, this story has a SCHOOL FOR ASSASSINS. And sure, this is already clear from the blurb so you may already be expecting it, but it is so much better than you could have expected! The training is brutal and the teachers are literally trying to kill the students in all sorts of creative ways. Mister Kindly. Mia has a shadowcat companion. Yes, a talking cat made out of shadows, named Mister Kindly. Yes, I was skeptical about that at first. But he was one of the highlights of the book and his interactions with Mia were pure GOLD. I kind of wish I had my own shadowcat companion right about now, just saying. The secondary characters. From the intimidating other students to the super intimidating teachers, this book was filled with super intriguing characters. Some of them I loved to hate and others I just loved. I loved getting to know them and I can’t wait to learn more still. The footnotes. What a fun, original way to do the worldbuilding! Though a bit weird at first, I came to love them and was always looking forward to the next one. They were darkly funny and a great way to learn more about the world. So if you’re like me and you’re struggling a bit in the beginning of this book, please hold on and give it a chance. Because despite the slow start, this book is one big whirlwind of a ride. It’s going down as a new favorite and I can’t wait for the next books in the series! Have you read Nevernight? What did you think about it? I haven’t read this yet, but it’s near the top of my TBR. Thanks for the head’s up that it’s worth pushing through if I’m struggling at the beginning. I’m trying to get better at not immediately bailing on books that I’m having a hard time getting into at first. Great review! 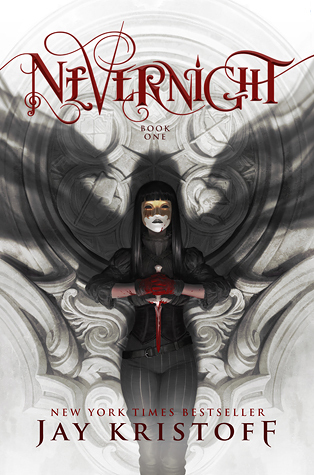 Nevernight was the first book I read by Jay Kristoof, but I really liked it! The writing style took me some getting used to, but I’m definitely interested in checking out his other books!